This old-fashioned Southern pecan pie is a traditional Thanksgiving pie. The pecan pie―also known as Karo pie―was originally introduced in 1902 by the company that makes Karo corn syrup. It has become a much-loved pie, always a favorite on the holiday dessert table. 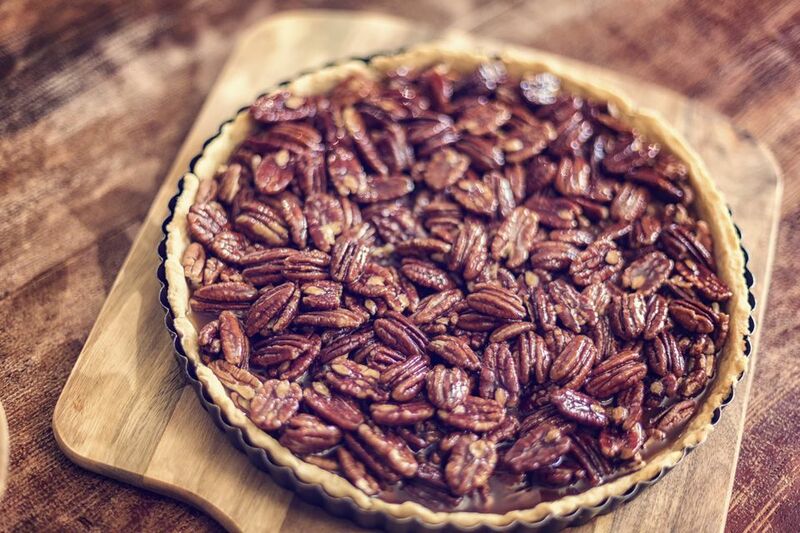 This is a classic pecan pie, made with homemade butter and shortening pastry. You can also use a frozen unbaked pie shell or use a refrigerated crust. Combine the flour, 1/2 teaspoon of salt, and 1 teaspoon of granulated sugar; blend well. Add the pieces of butter and shortening and work with a pastry blender until the mixture forms crumbs. Some crumbs should be large, about the size of peas. If you use a food processor, pulse for about 5 to 7 times. Work about 3 tablespoons of ice water into the mixture, then more water, about 1 teaspoon at a time, until the dough begins to hold together when a little is squeezed. Turn the mixture out onto a floured surface and press to form a flattened disc. Wrap in plastic wrap and refrigerate for about 30 to 45 minutes. Roll the dough out into a circle about 2 inches larger than the pie plate (upside-down measurement). Fit it into the pie plate and flute the edge as desired. Refrigerate until you are ready to fill the pie. In a large bowl, combine corn syrup, brown sugar, salt, butter, and vanilla; mix until smooth and well blended. Add the slightly beaten eggs and blend well; stir in pecans. Pour the pecan mixture into the chilled, unbaked pie shell. Bake in the preheated oven for 55 to 65 minutes, or until the filling is set. Check the pie for over-browning after about 40 minutes. If necessary, cover the crust edge with a pie shield or homemade foil ring to prevent excessive browning. Cool pecan pie thoroughly and serve with a dollop of whipped cream or vanilla ice cream. If you are using a frozen pie shell, place it on a baking sheet before you add filling. It's much easier to move to and from the oven that way. Walnut pie: Replace the pecans with the 1 1/2 cups of coarsely chopped walnuts.